As the weather gets warmer, your cat senses the onset of spring. One way her body reacts to the warmer temperatures and longer daylengths is to shed her winter coat and grow her summer coat. The same thing happens in the fall, as she sheds out her summer coat and prepares to grow her thick winter layer. Although most cats shed year-round, shedding intensifies in spring and fall. Aside from being a nuisance to owners, as they struggle to keep up with the dust bunnies and fur all over the furniture, hairballs can be a serious problem for cats. Many cats vomit hairballs more frequently at this time of year. This is unpleasant for the cat and some cats will have a decreased appetite for a few days because the hair is irritating the stomach, as well as taking up space that should be occupied by food. It's also irritating to owners, who have to clean up the mess when the hair makes its appearance on the floor. Sometimes, however, a clump of hair passes out of the stomach and into the small intestines, where it can cause an intestinal obstruction. In mild cases, the cat may go off its food for several days and vomit repeatedly, but the obstruction eventually makes its way through and out of the intestinal tract. In severe cases, the obstruction cannot pass and the cat requires surgery to survive. The best way to deal with hairballs is to prevent them. If your cat eats some dry food, a hairball formula dry cat food may be helpful. You can also "make your own" hairball food by adding one pinch of an unflavored fiber supplement, such as Benefiber or Metamucil, to your cat's canned food twice a day. The fiber helps to sweep the hair through the GI tract and prevents it from building up in the stomach. 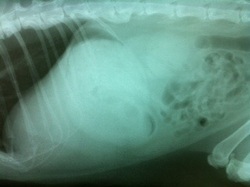 Hairball remedy, such as Laxatone or Laxaire, is also a great way to both prevent and treat hairballs. Hairball remedy is a flavored mixture of petroleum jelly and mineral oil, which forms an oily lubricant that helps hair pass through the digestive system. Interestingly, some cats are willing to eat unflavored Vaseline or generic petroleum jelly, and this is an acceptable substitute. We do not recommend giving mineral oil by itself, as it is easily inhaled by the cat as it is swallowed and can cause fatal lung toxicity. Hairball remedy is highly effective when given properly. A proper dose for a cat is one fingerlength of the gooey substance given orally 2-3 times a week on an empty stomach. We may advise you to give it daily for a short time if we are suspicious that your cat is suffering from a hairball problem. If you have questions or need to purchase hairball remedy, come in to the office or give us a call! 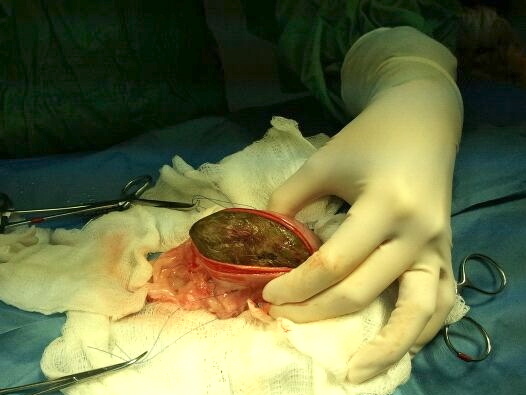 This is a 5.5 oz hairball being surgically removed from the stomach!